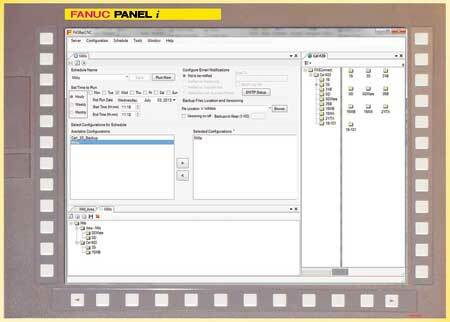 ROCHESTER HILLS, MI - FANUC America Corporation introduces FASBacCNC (FOCAS Automation Solution Backup CNC), a powerful and easy to use network based backup solution for FANUC CNCs. FASBacCNC eliminates the risk of one of the most common and expensive service interventions – extended downtime as a result of the loss of critical files on the CNC following a hardware failure or operational mistake. FASBacCNC provides peace of mind by automatically backing up the CNC files that have been created and customized by the machine tool builder or end user to a remote network server. Files backed up can include CNC parameters, PMC ladder and parameters, custom macros and variables, part programs, tool offsets and workpiece coordinate system offsets. FASBacCNC is the latest addition to the FAS (FOCAS Automation Solution) lineup. The complete FAS (FOCAS Automation Solution) suite includes: FASBacCNC – a user interface for FASConnect allows browsing of all FASConnect servers and backup data either manually or on a scheduled basis, FASConnect – a Windows® service allows access and management of text data from all FOCAS enabled CNCs across a network, FASOPC – an OPC 3.0 compliant server for easy retrieval of machining data from all FOCAS enabled CNCs.